Alfa "makes gorgeous cars and nothing more," says VW CEO Martin Winterkorn. 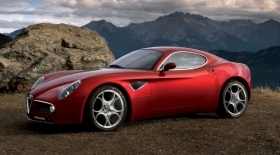 Pictured is the $225,000 Alfa 8C Competizione. VW's expressed interest in Alfa Romeo, and its reported intentions for supercar manufacturer Ferrari, “are nice dreams,” Marchionne said at an event in Turin, Italy, on Thursday in comments reported by the Ansa newswire and confirmed by a spokesman at Fiat. Volkswagen Supervisory Board Chairman Ferdinand Piech said in September that VW is “monitoring” Fiat's stance on Alfa Romeo in the event the Italian company wants to sell. Ferrari is the “real” target of Piech's interest, Germany's Manager Magazin reported in its November edition, citing unidentified observers in the industry. Alfa Romeo “is just a dream,” and the unit “makes gorgeous cars but nothing more,” Ansa cited Winterkorn as saying at the Turin event. Marchionne said on Sept. 30 that he has no intention of selling Alfa Romeo and instead wants to rebuild the brand by developing new models and re-entering the United States after its departure in 1995. The CEO has said the division needs to deliver 300,000 cars a year to make a profit and set a 2013 deadline for reaching that sales goal. Fiat doesn't provide separate figures for Alfa Romeo. The division is probably losing about 300 million euros ($410 million) annually, Max Warburton, a Sanford C. Bernstein analyst in London, estimated last month. Ferrari's third-quarter trading profit, or earnings before interest, taxes and one-time gains or costs, rose 46 percent to 76 million euros. The division, which makes the $228,000 California supercar, is forecasting full-year earnings growth exceeding 10 percent. Trading profit for all of Fiat's car divisions, which also include the namesake brand and the Maserati sports car unit, increased 1 percent. Fiat owns 90 percent of Ferrari after a 5 percent stake purchase from Mubadala Development Co. for 122 million euros in the third quarter. Marchionne said in September that he isn't planning to list the unit.